After recently returning from a run of shows and festival performances throughout The Netherlands; Claude Hay has unveiled a film clip for the single ‘Borracho’ – the first for his new side project ‘The Gentle Enemies’. Animated in the style of Mexican Bar Noir by Mike Foxall (the artist behind Frenzal Rhomb and Nancy Vandal) – the new video tells a dark and gritty tale of Claude and the boys angering the local drug lord though the misuse of tequila, and the resulting Tarantino-esque escapade that follows. The prestigious US-based International Songwriting Competition (ISC) has announced its 2013 winners and many Australian artists are among them. Out of nearly 20,000 entries from 120 countries, and 68 winners in total, Australia scored three First Place wins, six Second Place wins, four Third Place wins, and an amazing 32 Honorable Mentions! This year’s Grand Prize was awarded to jazz trumpeter, composer, and arranger Shunzo Ohno for his song “Musashi.” This is the first time in ISC’s 13-year history that the Grand Prize has been awarded to either a songwriter in the Jazz category or an artist from Japan. Australian prize winners include Missy Higgins and Butterfly Boucher, who achieved second place in the AAA category for their song “Set Me On Fire”. Third place in the same category went to Alice Springs based artist Dave Crowe (Resin Moon). In the Adult Contemporary category, Darwin’s Worldfly came in second. 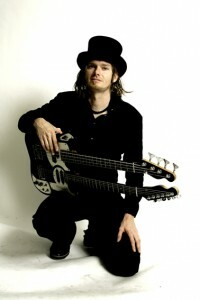 Melbourne’s Jamie Saxe (The Mighty bUZZniks) picked up third in the Children’s Music category. Taking out first place in the Country category was Adam Eckersley, Jason Reeves, and Danelle Joy Leverett for their tune “Give Her The World”. Melbourne music identity Charles Jenkins finished second in the Folk/Singer-Songwriter division and taking out first prize in the Lyrics category was Sydney’s Tony King (Beautifully Mad). In the Music Video section Kimbra (NZ) took out first place with Clubfeet coming in second and Bertie Blackman third. Sophie Hanlon won second place in the Performance section while Kimbra took that one out too. Australian artists took out first, second and third places in the rock division. The Preatures were winners with “This Is How You Feel”, while Apes, who hail from Bacchus Marsh came in next, followed by Calling All Cars. Established in 2002, ISC awards more than $150,000 in cash and prizes to amateur and professional songwriters around the world. Past ISC winners include Gotye, Bastille, The Band Perry, Passenger, Kasey Chambers, Kate Miller-Heidke, Gin Wigmore, Andrew Bird, The Living End, Eskimo Joe, and many more. April 2014. 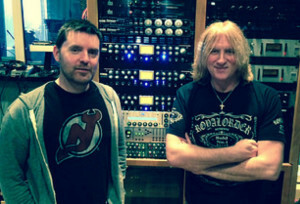 Having worked with UK rockers Def Leppard in the studio and as concert front-of-house engineer for well over a decade, Ronan McHugh has had ample opportunity to try out lots of different gear with the band. McHugh has been using the new PreSonus ADL 700 tube channel strip to record the band’s first studio album since their 2008 Songs from the Sparkle Lounge, and he gives the channel strip high marks all around. For the album, McHugh close-miked both guitar cabinets, using a combination of Sennheiser MD 409, Shure SM7, and Electro-Voice RA 20 microphones into the ADL 700s. He ran Rick Savage’s bass directly into the third unit. “They all sounded really, really good,” says McHugh. “I’ve been very impressed with them. And I can see that they’ll become a staple for this kind of stuff.” McHugh plans on taking all three ADL 700s on the road, using them on the band’s upcoming North American summer tour with KISS. The tour kicks off on June 25. BIGSOUND, the annual music conference held in Brisbane (September 10-12) has signalled its 2014 intentions by bringing a collection of the world’s most influential live music bookers to check out Australasia’s hottest rising acts. BIGSOUND 2014 will be the biggest gathering of the contemporary live music industry ever assembled in Australia while expanding to accommodate even more artists. With applications for artists closing on May 9, the event has unveiled the first round of industry speakers which include representatives from South By Southwest (US), The Great Escape (UK), The Windish Agency (US), Superfly / Bonnaroo (US), Outside Lands (US), X-Ray Touring (UK), Clockenflap Festival (HK), Iceland Airwaves (ICE), Panache Booking (US), St. Jerome’s Laneway Festival (AUS), Village Sounds Asia (SNG), Paradigm Agency (US), Bowery Presents (US), Sydney Opera House (AUS), Four Artists Booking (GER), FKP Scorpio (GER) and more. Between them, these bookers look after some of the world’s biggest live music brands and artists in a sector of the market that is continuing the boom across the world. They will impart their knowledge at the BIGSOUND conference before checking out the best new music in the Southern Hemisphere at night, with this year’s event expanding to more bands and venues than ever before. Earlybird tickets for BIGSOUND 2014 are on sale now. Held on September 10-12, the event will again be three days and two nights of live music, parties, forums and seminars as well as the usual (and unusual!) surprises. With over 150 international industry guests as well as the who’s who of the Australian industry converging on Brisbane to devour the best music the region has to offer, there’s no better place for artists to get in front of the movers, shakers and tastemakers that are going to shape the next decade in music. With the last three years’ conferences selling out earlier every year, be quick to get your tickets sorted now. 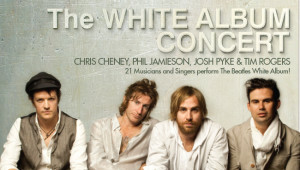 The White Album Concert, a sold-out live rock experience from 2009 is back, featuring 30 of the Beatles’ most breathtaking songs performed with a 17-piece rock orchestra. Not even the Beatles attempted to perform their classic self-titled double album live on stage. But in the winter of 2009, to celebrate its 40th anniversary, four of our greatest rock’n’roll showmen left a trail of standing ovations and ecstatic reviews when The White Album Concert sold out 11 theatres in five cities across Australia. The Beatles’ most challenging and stylistically varied collection of songs was taken apart and reassembled track by track by four singers at the peak of their powers — Tim Rogers, Josh Pyke, Chris Cheney and Phil Jamieson. The White Album was the sound of John, Paul, George and Ringo throwing everything they’d learned into their musical blender. This major work bursts with variety, creativity, experimentation, and the genius of The Beatles during one of their most intense, fertile, periods. It is a timeless album, yet very much of its time. It’s 30 songs veer from the populist stomp of Back in the USSR and the mind-bending Happiness is a Warm Gun to the melodious sorrow of While My Guitar Gently Weeps, the ska pop fun of Ob-La-Di, Ob-La-Da, and the hard rock prototype Helter Skelter. 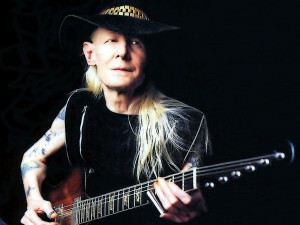 It was on, then off and there was speculation it was never going to be finished, but the documentary ‘Johnny Winter: Down and Dirty” finally premiered at this year’s South by Southwest Film Festival in Austin, Texas. The film by Greg Oliver follows Winter around the world, on stage, back stage and beyond. When Australian Musician’s Greg Phillips spoke to Winter last year, even Johnny wasn’t confident the film would be completed. “I don’t think he has enough money to finish it,” Johnny said. However, Paul Nelson, WInter’s guitarist and tour manager overheard and was quick to put the story straight. “No,” Paul laughed. “He’s on another project, the projects have overlapped. He’s doing a documentary on Lou Albino, the wrestling guy. We are playing The Olympia in France, in April with Alvin Lee and Robben Ford. He’s going to film there.” As promised the gig was filmed, but sadly Alvin Lee passed away just prior to the show. Australia’s Tommy Emmanuel also played on that bill. The documentary features cameos by a myriad of rock identities and offers rare archival footage of Winter performing. It is unclear at this stage if the film will get a cinema release, however it will be available on Blue-ray/DVD soon. Nobody was more surprised than Russell Morris himself, that his album Sharkmouth became a platinum-selling hit. The project was created after Russell had read about a 1920’s Gangster from Sydney, Shark Jaws. This was the driving force behind a want to create an album including some dodgy Australian characters from the 1920/30’s era such as gangsters Squizzy Taylor and Les Darcy. 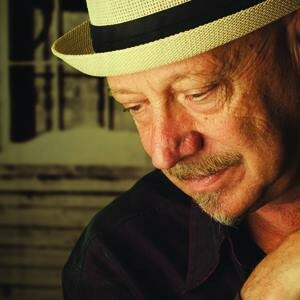 On April 11 this year, Russell released Van Diemen’s Land, the follow up, a companion piece to Sharkmouth. Van Diemen’s Land picks up where Sharkmouth left off, this time covering great Australian characters and stories including Breaker Morant, Sandakan, the Eureka Stockade and many more. Morris is joined on Van Diemen’s Land by a host of special guest artists including Joe Camilleri, Rick Springfield, Rob Hirst (Midnight Oil), Scott Owen (The Living End), Ross Hannaford (Daddy Cool), Vika & Linda Bull, Phil Manning (Chain), Joe Robinson and Shannon Bourne. Music Publisher Hal Leonard has released a swag of fantastic new music books for March including Lorde’s Pure Heroin album, featuring 10 tracks from the New Zealand pop sensation. Also released is Their Top Hits 2013 book, featuring arranged for easy piano versions of songs by Bruno Mars, Pink and 16 other hit makers. Watch Nathan Rippon’s rundown on releases here or visit www.halleonard.com.au for more.